Orbital Sciences Corporation Monday rolled the first stage of its Antares™ rocket to the launch pad of the nation's newest spaceport—the Mid-Atlantic Regional Spaceport at Wallops Island, Virginia. While in Florida, Space Exploration Technologies (SpaceX) moves ahead with preparations for an October 7 launch to the International Space Station for NASA's first Commercial Resupply Services (CRS) mission. These developments mark progress in returning space station resupply missions to American soil. With rollout of the Antares rocket, Orbital continues toward a series of tests at the launch pad that will lead to a planned flight test later this year. The company also will fly a demonstration mission to the space station to test both the Antares rocket and Cygnus cargo spacecraft in the coming months. The milestones will be completed prior to beginning formal cargo delivery missions to the space station under NASA's CRS agreement. 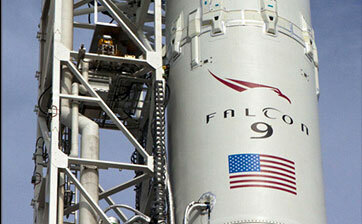 Sunday, SpaceX conducted a successful static fire test of its Falcon 9 rocket. The test was part of a full dress rehearsal in preparation for the first of 12 contracted flights by the company to resupply the space station following a successful demonstration mission in May. The October 7 launch is scheduled for 8:35 p.m. EDT from Space Launch Complex 40 at Cape Canaveral Air Force Station in Florida. "Today's rollout of Orbital's Antares™ test vehicle and the upcoming SpaceX mission are significant milestones in our effort to return space station resupply activities to the United States and insource the jobs associated with this important work," said NASA Associate Administrator for Communications David Weaver. "NASA's commercial space program is helping to ensure American companies launch our astronauts and their supplies from U.S. soil." Orbital and the Mid-Atlantic Regional Spaceport (MARS) have completed checkout and performance testing of Launch Pad 0A and its associated Liquid Fueling Facility (LFF), paving the way to begin on-pad operations for the Antares Program at Wallops Island, Virginia. On October 1 an Antares first stage test article was transported from the Horizontal Integration Facility (HIF), where the Antares launchers are assembled, to the pad about a mile away. At the pad, the test article will be used to verify the launch pad fueling systems through a series of "wet dress rehearsals" during which Antares is fueled and then defueled to test all launch complex systems. Later, Orbital will conduct a 30-second hot-fire test of the Antares first stage and its dual AJ26 rocket engines. After these tests are successfully conducted, the test article will be returned to the HIF and the stage and the engines will be refurbished for a later flight. Approximately one month after the successful hot fire test, the maiden flight of the Antares rocket will occur. For this mission Antares will carry a simulated payload that will be heavily instrumented to gather data on the launch environment aboard the vehicle. In addition, four small "pico satellites" will also be deployed from two dispensers that will be integrated with the mass simulator. In 2013 Antares will conduct a demonstration mission to deliver cargo to the International Space Station (ISS) under the company's Commercial Orbital Transportation Services (COTS) agreement with NASA. For this mission, a fully operational Cygnus spacecraft will be launched into orbit by Antares and, following an extensive series of in-orbit tests, will autonomously rendezvous and berth with the ISS. The first Cygnus will deliver approximately 550 kg of cargo upon its arrival and will remove about 1,000 kg of disposal cargo upon its departure from the Station.